I always love a good Asian-inspired meal, and this has seriously jumped to the top of my list of favorites at the moment. I love this variation of lettuce wraps like I’ve never loved lettuce wraps before (and I kind of seriously love lettuce wraps . . . the proof is here and here). This variation is, to no surprise, infused with Thai flavors. We’re talking peanut sauce, lime, cilantro, fresh veggies, and chicken. The texture is fabulous by offering a little bit of crunch thanks to those water chestnuts and butter lettuce. These are fresh, flavorful, and left us wishing we had doubled the recipe! My husband said, “When I think of a Food Network competition, these are what I imagine would come out of it.” Yeah . . . I guess they are Food Network worthy according to the hubby. The peanut sauce offers a genuine sweetness because of that yummy honey. You can make it spicy if you prefer by adding extra Sriracha sauce. I kept it mild so my little one-year-old wouldn’t complain. Either way . . . you’re going to loooooove it! 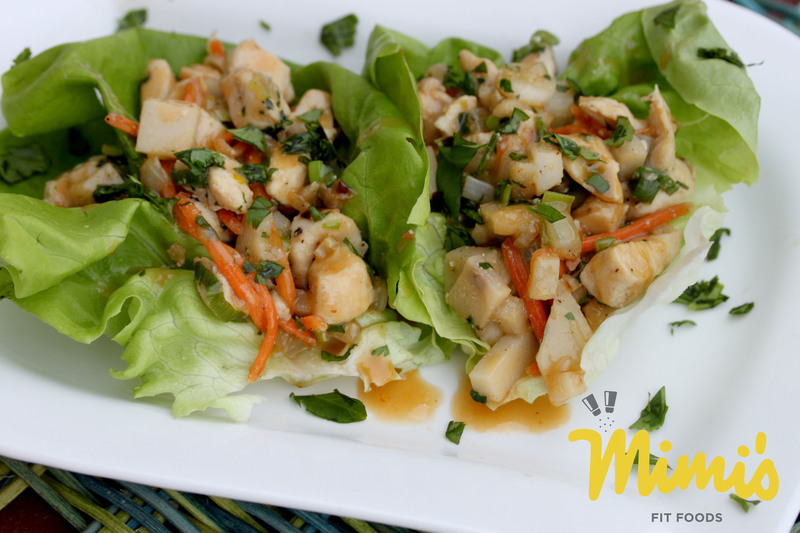 This sauce is what really made these lettuce wraps super duper awesome! We ate these with a side of brown rice. The meal was perfect . . . well, better than perfect. Heat the olive oil over medium heat in a large non-stick skillet. Sauté the yellow onion and bell pepper and 1/4 teaspoon of the salt until the vegetables are fragrant and soft, 7-10 minutes. While the vegetables are cooking, mix the ingredients for the sauce together, cover and refrigerate until serving. To the veggies, add the green onions, carrots, garlic, chicken, and water chestnuts. Stir and then add remaining salt, pepper, Sriracha, soy sauce and cilantro. Stir well. Allow the mixture to cook for 1-2 minutes more and remove from heat. Serve the mixture in lettuce cups/leaves and garnish with the Sweet Peanut Sauce, additional chopped cilantro, and fresh lime juice.